· user-defined names for Top-menu buttons of the application Air Manager. · user-defined names for the displayed current statuses of lines in rec- and playlists. Tab Preview implements setting up the main modes of displaying and contains two windows: Preview Parameters and Output Hardware. Display engine allows choosing the technology of video displaying in the window File Monitor. The choice depends on work features of a graphics card of the client PC with the launched Air Manager application. In some cases, graphic cards integrated into a motherboard don’t display video in the Default mode – just choose a mode from the list (to change the mode reload the application). Deinterlace – turning on/off the mode of forced deinterlacing while viewing video in full resolution in the window File Monitor. Use Lowres Proxy – turning on/off the mode of displaying proxy-copies (if there are any) in the window File Monitor. If the option isn’t active, the window File Monitor will display video in full resolution. If you activate the option, reload the application. Compress Audio – activation of this option allows the application to accept the compressed low-speed audio stream while viewing materials in the window File Monitor. This function may be useful in case of relatively low throughput of the communications channel between the SL NEO server and the client station, and if the proxy-copy audio track is not compressed (PCM with 1538 kBit/s speed for the stereopair). If you activate the option Compress Audio, the server database module will automatically start to create a compressed audio stream for viewing, even if the original stream of the proxy-copy is PCM (it relieves the channel). The encoding parameters cannot be configured. Sound Channels – the number of audio channels that will be displayed in the window File Monitor and in the application’s Record-lists. For providing correct work you should also set the appropriate number of audio channels at the server platform. The option allows listening up to 8 audio channels at the client station while viewing materials in the window File Monitor. Show Overload – the option allows displaying the relative values of audio levels more than “0” in the window File Monitor. If you activate the option, reload the application. The window Output Hardware allows the user to redirect audio/video displaying from the window File Monitor to the output board installed at a client station. Thus, you can view materials using a separate monitor. IO Board allows choosing the type of a hardware output platform (board) that is installed at the client station (or at the server itself). Matrox DSX, DekTec DTA (SDI only), BlackMagic Decklink and Computer Screen (graphics card of the client station) are supported. HW Channel - the number of the physical output channel (port) for playout that will be used by the Air Manager application for displaying. You should avoid conflicts while setting this parameter (any other software, including SL NEO server software, shouldn't use the port that will be set for Air Manager). Video Mode – allows choosing the displaying format. Conversion – setting up the mode of Up/Down conversion. Keyer Mode is the mode when a board may form a pair of Fill+Key signals, while viewing 32-bit video with an alpha-channel (External mode, was developed for Matrox DSX boards). The options Audio Meter and Display Timeсode allow turning on the image of an audio indicator and a counter that displays the current position of a cursor in the window File Monitor (in the timecode format) when viewing through the output board. After setting up the modes in the window Output Hardware you should reload Air Manager. The tab Look and feel is designated for configuring the appearance of the Air Manager user interface. Settings of the window Tables Look allow the user to change the font type and size of lines in rec-lists and playlists (Broadcast and Record windows). Font Family sets up the font name for all Broadcast and Record windows, and for the window Media Browser. The parameter Font Size defines the font size for all windows, the parameter Cell height defines the height of lines in Broadcast, Record and Media Browser windows. Draw horizontal/vertical lines - these parameters allow users to turn on displaying the horizontal and vertical lines that separate columns from lines in rec-lists and playlists. Highlight even/odd lines - the parameter allows turning on the color extraction for adjacent lines in rec-lists and playlists. Panel Font Size - sets up the font size for an information panel placed at the bottom part of the window Broadcast. Settings of the window allow configuring the parameters of automatic scrolling the rec-lists and playlists (Auto Scroll). The function of scrolling is turned on automatically when the sequence (rec-list, playlist) is launched and allows the operator to see the executable line of the list and the previous/following lines. The function Auto Scroll is turned off automatically when editing a text line directly during its execution (it needs to be activated again manually, in the Air Manager Top-menu, when editing is finished). AutoScroll button text - you can type the text into this field and it will be displayed next to the check mark Auto Scroll in the Air Manager Top-menu. Decorate root allows turning on the additional elements when displaying group lines in the Broadcast windows. Number of rows above current - setting the number of lines displayed before the executable line in the Broadcast and Record windows. Default D&D mode - setting up the mode that will be used when dragging a line with a mouse in the Broadcast and Record windows. The default value is copying lines (Copy). Auto clear replace mode is the mode of automatic turning off the Replace function in playlists. Replace – is an insert of a new line into the playlist with replacement of the selected line. The Replace mode is activated once when you set up the Replace parameter at the bottom part of the Broadcast window and then it is turned off automatically. If you deselect the check box Auto clear replace mode in settings, it will allow you not to turn off the Replace function. Font Family - sets up the font name for the buttons; the parameter Font Size defines the font size; the parameter Button height specifies the height of buttons. Show frames in clock – activation of this parameter allows displaying hundredth parts of seconds in the clock placed in the Air Manager Top-menu. The parameter Frame validation time affects the accuracy of displaying the hundredth parts. The item Actions allows adjusting the modes of the event start for rec-lists and playlists. Play/Rec start hot key - setting the “hot key” at the client station for controlling the start of events in rec-lists and playlists. Controller type - allows choosing a controller model when working with recording channels (VTR control, viewing materials in Media Browser). Port - the number of the COM-port of the client station that is connected with the controller. The window GPI allows the user to adjust management of the main functions of record- and playlists with using the commands broadcasted through the COM-port of the client station. 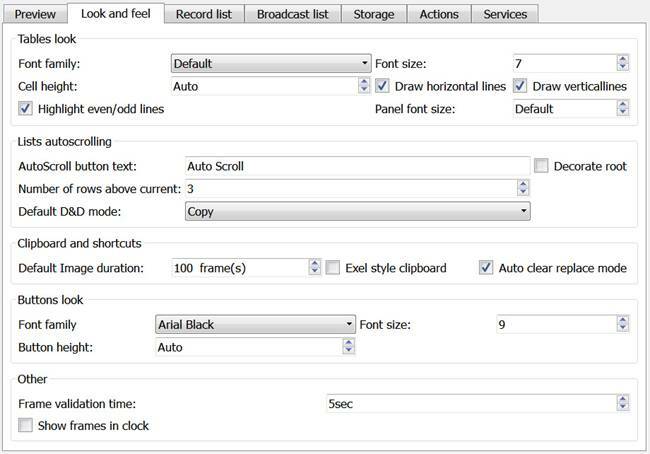 The given settings may be useful when using the SL NEO server as a file player in broadcasting studios and in situations, when the process of playout management needs complete involvement of an operator. Make current only - by pressing the button GoTo, implementing the current action will be continued, the selected playlist line will change its status for GoTo. Pressing the button Play after that will start playback of the selected line. This option gives the possibility to replace the line for transition of the command GoTo. Make current and Pretake - by pressing the button GoTo, implementing the current action will be continued and the selected playlist line will change its status for Cued - the event is ready and awaits for the start command. Further clicking the button Play will lead to instantaneous start of playout of the selected line. This option doesn’t give a possibility of choosing another line – the transition is possible only for the line with the status Cued. Make current and Play (the default value) – if you press GoTo, the application will implement the instantaneous start of executing the selected playlist line. Restart and Pretake - if you press the button GoTo, execution of the current event will be stopped, and the selected playlist line will change its status for Cued – the event is ready and awaits for the start command. Settings of the variants for response of the Skip button are the commands of the urgent transition to executing the next event of the playlist. The command Skip is the particular case of the command GoTo, so the variants of response are completely identical. 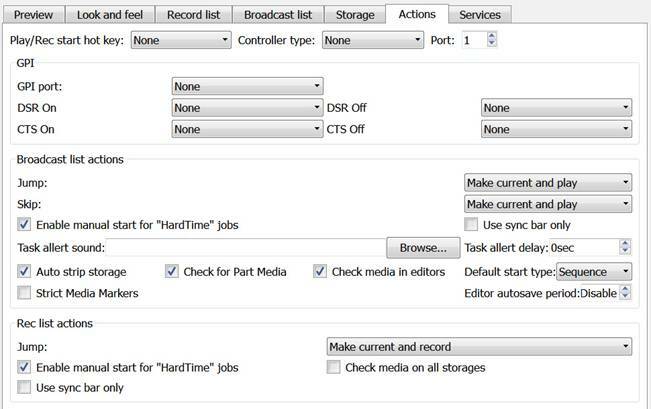 Enable manual start for Hard Time Jobs - this parameter is set by default and allows manual launch of playout of events that have the type of start Hard Start. The option Use Sync bar only allows control of playout channels with using only the buttons for synchronous channel management from the Air Manager Top-menu. At the same time, activation of the Broadcast windows won’t have any influence on the choice and change of the controlled channel. Check for part media is the parameter that allows turning on signalization in the Broadcast windows, and in the playlist editors, for those lines that contain materials in the process of import or recording (the color of the line text is red, the title Part Media is displayed in the playlist column Status). Check media in editors - the parameter allows turning on/off verification and signalization in the playlist editors for those lines that don't have related materials in the server database (the color of the line text is red, the title No Media is displayed in the column Status of the playlist editor). Verification is implemented by the fields Media. Auto or Sequence - the type of start set up by default during the manual placement of clips to the playlist. The lines with this type start automatically, right after the end of playback of the previous line; it provides non-stop execution of the sequence of events. Manual - this type of start means manual launch of a line by the command Play, GoTo or Next. Hard Start - this type of start means the start of execution of a line/event at a set time (by the server system timer). When forming a playlist, the type of start Manual may be useful as the default one: it can help during playout of clips in broadcasting studios for production of real-time programs, and in situations, when you need to playback materials not in the sequence, but in the random order. Editor autosave period - defines the periodicity of autosave for the playlist editor, in minutes. Make current only - by pressing the button GoTo, recording the current event will be stopped, further clicking the button Rec will start the record of the selected line. Make current and Pretake - by pressing the button GoTo, recording the current event will be stopped, the selected rec-list line will change its status for Cued – the event is ready and awaits for the start command. Further pressing the button Rec will implement instantaneous start of recording the selected line. Make current and Record (the default value) - by pressing the button GoTo, recording the selected line in the rec-list will immediately start. Enable manual start for Hard Time Jobs - this parameter is set by default and allows manual launch of recording the events that have the type of start Hard Start. The option Use Sync bar only allows control of recording channels with using only the buttons for synchronous channel management from the Air Manager Top-menu. The option Check media on all storages allows the user to check coincidence of names in the fields Media for the record events and clip names for all network databases that are connected to Air Manager. To save the implemented settings, you can use the button Save to file, placed in the lower part of the main configuration window. If you want to save positions of the windows, use the menu command Window/Save Windows. To quickly transfer the Air Manager configuration to another PC or to restore the previous configuration, enter data from the corresponding *.reg file into the Windows register. Air Manager contains options –lock-config and –unlock-config; they allow the user to show/hide the item “Configure” in the menu File. To activate/deactivate the menu Configure, open the command line and launch the command “airmgr ––lock–config” or “airmgr ––unlock–config”. This option allows the user to exclude access of other users to the settings of the application.